I recently had a great ricotta cake at the Carriageworks Farmers Market – a fantastic fresh produce market in Eveleigh, in Sydney. The cake had a great texture and was quite delicious. So I decided to make a ricotta cake with a lemon theme – lemon zest and juice in the cake, and also lemon thyme, my all time favourite herb! The cake was beautifully moist, the ricotta really helping out here. Adding lashings of buttercream icing and the result was complete lemon lusciousness! Preheat the oven to 170 degrees fan forced. Grease a 20cm springform tin (or 22cm tin for a slightly flatter cake), and line the bottom with baking paper. Cream the butter and sugar in an electric mixer until well mixed and light and fluffy. Beat in the eggs one at a time, making sure to mix until the eggs are well incorporated. Fold in the self raising flour and baking powder. Fold in the ricotta until incorporated, but being careful to not mix with too a heavy hand. Mix in the lemon juice and zest and the leaves from a few sprigs of thyme. Spoon into the prepared tin, and bake for 35-45 minutes or until a skewer inserted into the centre of the cake comes out clean. Remove from the oven and cool for 10 minutes before removing the outer ring of the tin and carefully sliding off the base. For the icing, cream the butter and icing sugar with enough of the lemon juice to make a lovely lemony frosting. Liberslly ice the cake with a thick layer of butter cream. Scatter some thyme sprigs on top for decoration. I added some candied lemon slices, but in hindsight the cake doesn’t really need them! 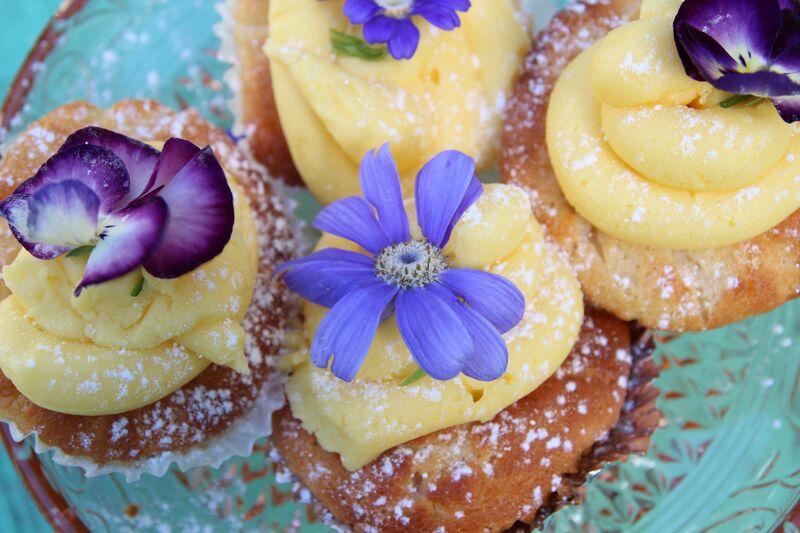 Posted in Cakes, Dessert, Sweet Food and tagged afternoon tea, citrus, fresh cheese, frosting, lemon thyme. Bookmark the permalink. Here is a quirky celebration cake, or if you’re looking for a cake to make that requires a few cake decorating skills. Nothing too challenging, I assure you! I created this one lazy Saturday, with nothing more in mind than I wanted to make a cake that looked good and on which I could try out a few new skills in icing and decorating. As I’m the classic rustic baker, this cake is quite achievable for anyone with some basic skills! I was inspired by a recent trip to Saga in Enmore, in Sydney’s inner west where the legendary Andy Bowdy makes awesome cakes! Check out the website here! You could use all or just some of my ideas, and tailor make the cake to suit your own creativity. And by the way, for us Aussies, who only recently have (limited) access to clementines, mandarins would be great too! The full description of the cake is this: Clementine and Almond Cake with Raspberry Meringue Buttercream, White Chocolate Crumb, White Chocolate Passionfruit Drizzle, Toffee Fruit. The cake itself is based on that wonderful, and now quite universal, orange almond cake from Claudia Roden, first seen in A New Book of Middle Eastern Food by Claudia Roden. I have included the quantities for a full size cake mixture. You probably won’t need the entire mixture – however if your cake is a baked in tins larger than the ones I’ve used (10cm/4in), you may need the whole lot. If you do have some mixture left over, just bake it in muffins molds for some seriously moist and delicious little cakes! The same with the meringue buttercream. I have given quantities enough for a large amount of frosting. You can make less, or keep the remaining buttercream for another bake. So here’s my recipe for the cake and its assembly. White Chocolate Passionfruit Drizzle or Dribble! Preheat oven to 160 degrees C fan forced, 170 degrees C non fan forced. Butter 3 small cake tins well, and line the bases with a circle of baking paper – I used tins 10cm/4in in diameter. Place clementines in a medium saucepan, cover with water, bring to the boil and cook until soft, about 20 minutes. Drain, cool and chop (discard seeds), then blitz in a food processor. Add the eggs and sugar and process until combined. Add the baking powder and ground almonds and blitz making sure everything is thoroughly mixed. The mixture is quite a wet one, so you can, if you’re nervous add 1-2 tablespoons of plain flour to make the batter a little less runny. Pour the batter into the prepared cake tins. Bake for up to an hour, or until until golden brown and a skewer inserted in the cakes comes out clean. If the cakes are still wet, bake for longer. However, the cakes may take less than the hour – check at the 40 minute mark for “doneness”. Cool the cakes before carefully turning out of the tins, removing the baking paper. Mix on medium or medium-high speed while pinching off small pieces of butter and throwing them in. Mix in vanilla. Continue beating for about 5 minutes until the meringue and butter mixture is completely amalgamated, thick and of icing consistency. Carefully fold in the freeze dried raspberry powder. This method is tricky and possibly controversial! There are no doubt recipes which tell you how to bake white chocolate in the oven until it caramelizes and goes crumbly. I can’t guarantee the success of my method – a lot will depend on the power of your microwave and you own baking intuition in judging timings. Essentially, you are cooking the white chocolate after it has melted, causing it to seize. My method is pretty easy – stick the white chocolate in pieces in the microwave (not on high- medium or even lower), and carefully melt. Then add the fondant creme or yellow food colouring mixing it through the warm chocolate. It will start to seize up. If it’s crumbly enough for you, then it’s done. If you want a more distinct crumb, place the chocolate back in the microwave on a low heat and cook for longer. I would advise going in 20 second bursts until you are satisfied with the crumb texture. This needs to be made when you are ready to apply the drizzle/dribble to the cake. Melt the white chocolate in a bowl over a pan of simmering water, taking care that the bowl does not touch the water. Or live dangerously as I did and melt the white chocolate in the microwave on a low heat setting. Once melted, add the fondant creme or yellow food colouring. As with the white chocolate crumb, the chocolate will probably seize. Take off the heat and add a few drops of milk and beat vigorously until the mixture is of drizzling consistency. It comes back pretty well. Put the caster sugar in a small frying pan over a medium heat and dissolve the sugar, being careful not to stir the sugar. Once the melted sugar has hit that beautiful toffee/tea colour, remove from the heat, and carefully pour most of the toffee over the clementine segments and strawberries on the baking paper. Pour the last bit of the liquid toffee onto the baking paper so that you can break it up into shards once cold. Carefully cut the 3 cakes horizontally in half, to create 6 layers. This can be quite tricky as this cake is incredibly moist and can break easily.Work out which of the 6 layers are good, and which you want to disguise. Pick the best for the top layer, a sturdy one for the bottom layer, and all the rest in between. Place the bottom layer on a cake plate or cake board. Ice with the meringue buttercream, again being careful as the cake is fragile. Repeat with the other layers, making the frosting on the top nice and thick. Ice the sides of the cake. A good palette knife will help with achieving a smooth texture. Now for the decoration! This is where you can use your creative license! I dribbled the white chocolate drizzle down the sides of the cake, scattered the white chocolate crumb over the cake and around the base, placed the toffee fruit on and around the cake, and lastly decorated the cake with the toffee shards. But absolutely you can have fun with this cake and do whatever you like to make your cake a quirky and visually spectacular creation! 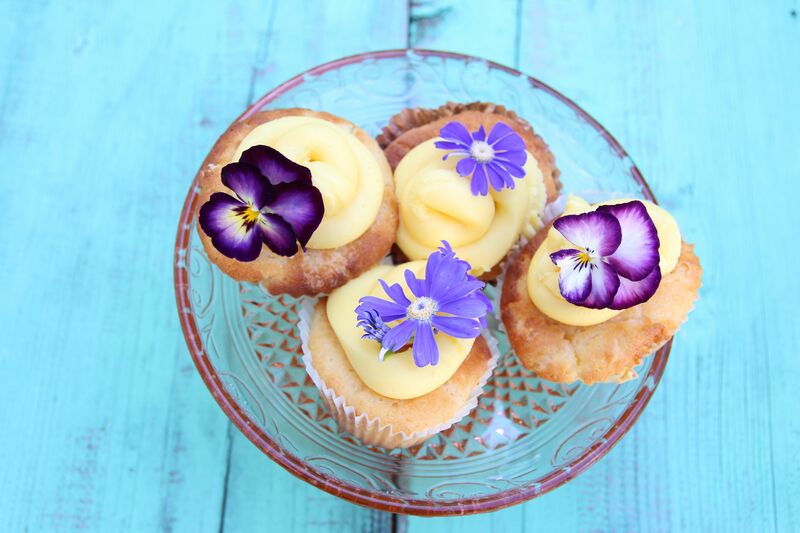 *My local kitchen store stocks a range of Roberts Fondant Cremes see here for the link to the Passionfruit one I used in the recipe. However you can easily get the yellow effect by just using yellow food colouring, and don’t worry about the passionfruit flavour. Posted in Cakes, Dessert, Sweet Food and tagged Andy Bowdy, celebration cake, chocolate, Claudia Roden, frosting, layercake, Saga. Bookmark the permalink. Another one bowl cake – I love them as they are SO easy! This cake has a good dollop of my home-made lemon curd in the cake, and spoonful or two also in the cream cheese frosting. The 2 tone colour combo was a bit of an experiment. I recently acquired a 3 cake mold set complete with plastic divider so you can make a layered cake with different colours. I only made one layer, and tried just two colours. Below is the picture from the box the molds came in. Not so sure of the success of the colour combo idea, maybe it needs practice. So the following recipe is for the cake alone – if you want to try different colours, have a go! The recipe makes 1 big cake or 2 smaller, flatter ones. Preheat oven to 180 degrees C or/160 degrees C fan forced. Grease 1 large cake tin (23cm/9″) or 2 smaller tins (18cm/7”). Place all the ingredients except the lemon curd in a food processor or stand mixer until well combined and smooth.Gently stir in the lemon curd. Spoon the mixture into 1 or 2 cake tins. Bake for 20-25 minutes or until a skewer inserted in the centre of the cake comes out clean. Cool in the tin(s) for 5 minutes, then remove from the tin(s) and leave to cool on a wire rack. These quantities are for the frosting for the top of the cake. Double if you want to fill the centre of 2 cakes. Cream the butter and icing sugar until soft and well combined. Beat in the cream cheese and lemon curd, being careful not to overbeat, but make sure there are no lumps. For 1 cake, ice the top of the cake with the frosting using a palette knife. Be liberal! 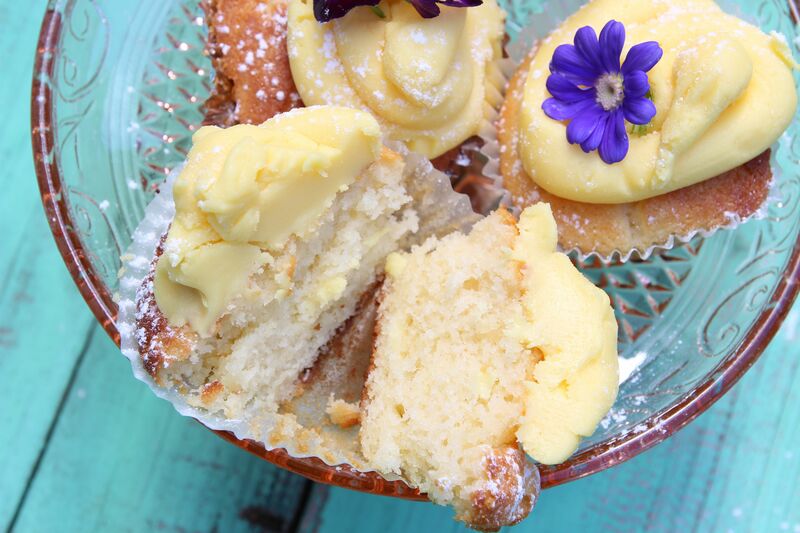 Drizzle the top with extra lemon curd. For 2 cakes, fill the centre of the cakes with frosting. Alternatively, you could fill with whipped cream. Place all the ingredients in a double boiler or bain marie. Cook over a medium heat, stirring with a wooden spoon, until the mixture thickens. Remove from heat and place in sterilized jars. Refrigerate before using. Posted in Cakes, Jams, Marmalades, Conserves and Chutneys, Sweet Food and tagged afernoon tea, cream cheese, frosting, lemon curd. Bookmark the permalink.